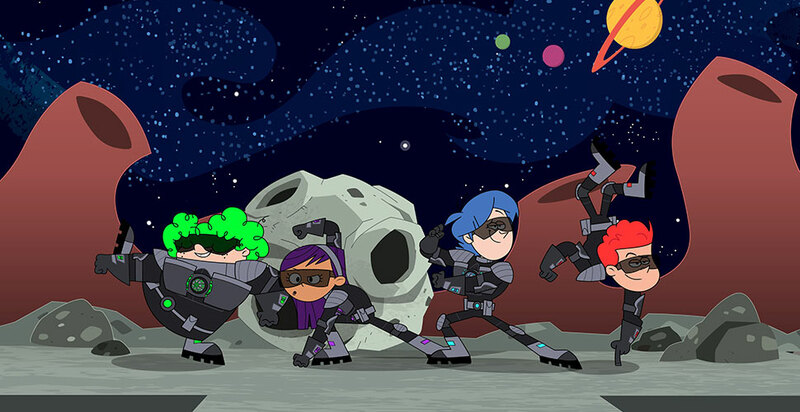 Supernoobs, is a super-powered series where four 12-year-old best-friendies – Kevin, Tyler, Shope, and the Roach – are accidentally recruited by an intergalactic alliance to help stop an evil space-virus spreading across the galaxy! So now these “noobs” have to not only survive the harrowing hallways of middle school, but have to crush microcosmic infections that turn earthlings into contagious beasts with one goal in mind – destroying Earth! Sometimes it’s hard to decide which mission is harder! Combine the already heroic task of surviving Parents, Hormones, Final Exams, Bullies, Jocks and Crazy Teachers, now add super-powers they have no idea how to use and the evil space virus that infects the Jocks, turning them into hulking Mashed Potato Monsters or the Bully turning him into a 9 foot laser-eye shooting BULL – now you’ve got Supernoobs!